Groovy brings you the best of both worlds: a flexible, highly productive, agile, dynamic language that runs on the rich framework of the Java Platform. Groovy preserves the Java semantics and extends the JDK to give you true dynamic language capabilities. Programming Groovy will help you, the experienced Java developer, learn and take advantage of the latest version of this rich dynamic language. You'll go from the basics of Groovy to the latest advances in the language, including options for type checking, tail-call and memoization optimizations, compile time metaprogramming, and fluent interfaces to create DSLs. The strength of Java is no longer in the language. It's in the Java Platform--the JVM, JDK, and rich frameworks and libraries. You don't have to leave the rich Java Platform to take advantage of dynamic languages such as Groovy. Groovy preserves the Java semantics and extends the JDK, so programming in Groovy feels like the Java language has been augmented; it's like working with a lighter, more elegant Java. If you're an experienced Java developer who wants to learn how Groovy works, you'll find exactly what you need in this book. You'll start with the fundamentals of programming in Groovy and how it works with Java, and then you'll explore advanced concepts such as unit testing with mock objects, using Builders, working with databases and XML, and creating DSLs. 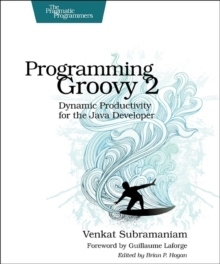 This book will help you quickly learn the new features in Groovy 2 so you can readily apply them on your next project. In addition, you'll master Groovy's powerful yet complex run-time and compile-time metaprogramming features. Everything's up to date and waiting for you to dig in!